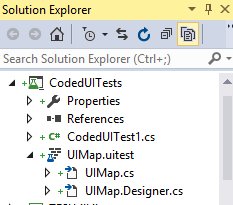 Coded UI Tests are something I’ve always thought would be useful, but have only recently actually used. This post is details of the first issue that I came up against. The recording that generated this was a quick test of a codeplex project of mine called TFS Utils. My initial thought about this was: what happens when the buttons move around the screen, or the resolution changes. So I tried both of those things… and it still works. The points above are relative; what’s more: they are optional. The following is the same code, copied over to UIMap.cs and the points removed. Since this Point seemed effectively pointless, I had a look around, and it turns out there is a reason; which is for menu buttons, where you need to specify a particular point within the button; rather than just anywhere. I would argue that the default recording should be what’s above, as it seems cleaner. I’m not strictly sure who I would argue that with though. This entry was posted in C#, Coded UI Tests, Unit Testing and tagged c#, Coded UI Test, Mouse.Click, WaitForControlEnabled, WinButton, WpfButton on March 30, 2015 by pcmichaels.